I can’t think of many other moisturisers that are this light, yet this effective. It’s like a cross between a moisturising fluid and a creamy serum – it absorbs perfectly into the skin without residue yet doesn’t leave any feeling of tightness. It feels delicate and flimsy as you apply it with dainty movements, but as soon as you feel the effects, you realise that it’s quite a powerhouse! I’ve been using this for many months now, at least once a day, and I have over half a bottle left. I feel pretty confident in saying that I use far less of this per “treatment” than I do any of my other moisturisers. I don’t even depress the pump all of the way down – I need about half a pump for an entire face-and-neck application. And I’m using it far more regularly than any of my other moisturisers, mainly because it suits so many different skincare “situations” and sits so well alongside other products. I can use it alone, before makeup, layered beneath a richer face cream, layered over a serum – its lightness makes it a brilliant companion to all other skincare elements. Those with oily skin may love the Elemental Emulsion purely on its own; it is non-greasy and it doesn’t sit heavily on the skin, but hits the spot perfectly when it comes to hydration. Those with dry skin will love this as a moisturising super-boost before applying a richer cream – it almost feels as though you’re applying water, so there’s no sense of product overload. I’d say though, that this hydrator really comes into its own with combination skin – moisturising enough for the drier areas and nicely balancing on the t-zone, it’s wonderful underneath makeup and equally brilliant last thing at night if you’re worried about breakouts. People who bagged it during the 30% discount period last year will be feeling smug, I’m sure. It was a hefty chunk of cash off the RRP! Though I will say (and I’ve gone through this rationale before, I know) that you use much less product with the Emulsion than you would with a thicker cream. It’s a big initial outlay but the bottle is lasting for ages! There’s a 15% discount running for readers – the code is AMR15 – and this is valid for the whole of January. I’m also currently researching alternative light-but-powerful hydrating fluids for various budgets, so keep an eye out for those reviews! 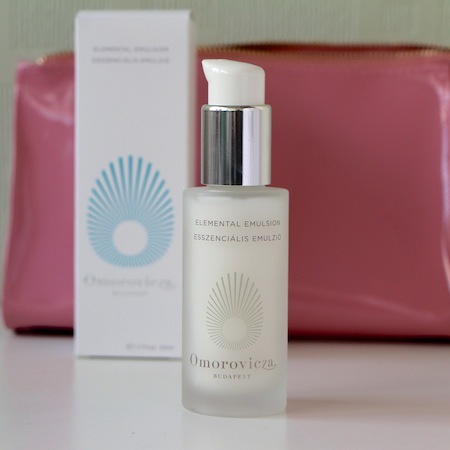 The marvellous Elemental Emulsion is £95 at Omorovicza here. Next Post The Massive 200,000 Youtube Subscriber Giveaway!